Duelyst giveaway! Win one of 100 codes for in-game currency worth $10! 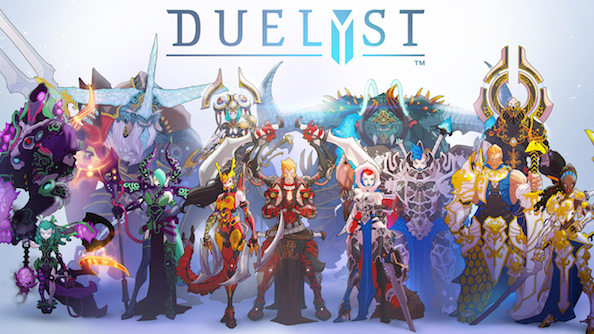 Duelyst is a brand new, free-to-play hybrid CCG and turn-based strategy game (quite a mouthful) that manages to combine the depth of Magic: The Gathering with traditional turn-based gameplay. Duelyst aims to give you short, exciting battles by changing traditional CCG mechanics, allowing you to use units as soon as they’ve been summoned to the board, and draw two cards per turn so you can utilise multiple card combos. Anyone familiar with Hearthstone will instantly feel at home with CCG side of Duelyst. You build a 40-card deck out of a selection of 300, and then send your buffed-up minions and spells onto the battlefield to chip away at your opponent’s health. Where Duelyst sets itself apart is what happens on the board during the match. Once you’re done with your hand, the game transforms into a turn-based strategy as your units come to life in charming pixel art sprites on the game’s grid. Similar to he Fire Emblem series, unit placement on the grid is essential to victory, as units operate on a rock-paper-scissors mechanic, so your ranged attackers will never stand a chance against melee warriors on the front lines. We’ve got 100 codes for in game-currency, worth $10, to give away, which can be spent on additional booster packs and cosmetic items. If you’d like the chance to win use our widget below to enter; the more actions you perform, the more entries we’ll throw in and the more chances you’ll have to win. We’ll also need your email address, but only so we can send you your code should you win – no spam, we promise! Duelyst can be downloaded for free from their site here.